The meditational qualities of Holy Basil (Tulsi) and this authentic high altitude, aged Patchouli, when ground and made into an incense or smoked, are widely popular among sadhus (mendicants) and used for enhancing dreams and meditations and calming the spirit. Holy basil (O. tenuiflorum; synonym, O. sanctum) is a sacred herb in India, where it is used in religious ceremonies and planted around Hindu temples and sacred groves. Sacred groves are believed to be the abode of certain deities or spirits. People often have visions of hippies running around with patchouli incense, but this fragrant herb has a long history of use across many cultures. The Holy Basil/Patchouli blend is one of our favorites for meditation. The meditational qualities of Holy Basil (“tulsi”) and this authentic high altitude, aged patchouli, when ground and made into an incense, are widely popular among sadhus (mendicants) and used for enhancing dreams and meditations and calming the spirit. 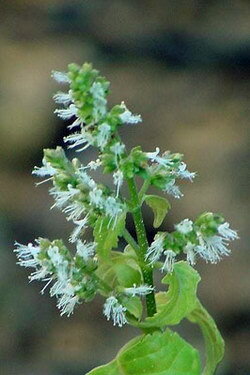 Holy basil (O. tenuiflorum; synonym, O. sanctum) is a sacred herb in India, where it is used in religious ceremonies and planted around Hindu temples and sacred groves. Sacred groves are believed to be the abode of certain deities or spirits. The seeds of Tulsi (sacred to Lord Vishnu), used in combination with the dried leaves of Patchouli, is popular and common among the mountain people of India. According to the traditional herbalists, smoking the two herbs through a pipe is recommended for improving vitality and protects the soul from ill spirits.